Turkey has presented the world with a huge supply of Antique & Vintage Oushak Rugs. Turkey has a rich history in the art of rug weaving. After Persia (Iran), Turkey has the most diverse, beautiful and artistic Antique & Vintage Rugs. There are a variety of styles like Oushak Rugs, Kars Rugs, Sivas Rugs, Kilim Rugs, Yastik Rugs, Overdyed Patchwork rugs etc which contribute to Turkish rug (also known as Anatolian Rug)collection. But, among the variety of styles, Oushak rugs has been the most popular. It is also one of the top most popular rug styles among all style rugs from around the world. Oushak (also known as Ushak) is a town in western Turkey. The art of weaving rugs in Oushak can be dated back to the early 15th Century. Turkish Oushak Rugs have dominated the market demand throughout history because of their unique pattern, quality weave, bold color and longevity. Oushak Rugs come in a wide range of shapes and sizes. Oushak rugs can vary from room size carpets to gallery size rugs and Runners. The eccentric quality & elegant beauty of Oushak Rugs caught the attention of European Merchants. These artifacts were the first among Oriental carpets to be exported in European countries in large quantities. By definition, rugs which are older than 100 years are called Antique rugs and older than 50 years are called vintage rugs. Skilled craftsmen form the 18th, 19th and early 20th century have produced high quality rugs which lasted for generations. The main purpose of antique & vintage oushak rugs as well as other Oriental Rugs was decoration. They were also used as shelter against cold and wall coverings. The use of rugs were mostly confined to elite classes in earlier times, but over time the have been introduced to the upper middle class and middle class households. In recent times, the trend of declaration with Oushak rugs is more popular than ever before. Due to its ever growing popularity, some other countries like India has now adopted the style. What to Look for When Buying Antique & Vintage Oushak Rugs? Material: All antique & vintage rugs must be made of natural fibers. Synthetic fibers like nylon, polyester, triexta etc were introduced in recent times. The most common natural fibers prior to 1950s were wool, cotton and silk. Use of wool and cotton wefts were general practice. Wool was harvested mostly from sheep herds and goats. Naturally wool is resistant to water and stains, ensuring a long life for antique & vintage oushak rugs. Hand-Knotted: Antique & vintage Oushak rugs are hand knotted. The invention of power loom was not done until recent years. Craftsmen knotted every single knot with their hand. To tell if a rug is hand-knotted or not, the best way is to look at the back. Due to human error, the fringes are not completely homogeneous and sometimes the white line of wefts can be seen. Dye: Antique Oushak Rugs have deep color but more warm and light colors were introduced in the later part of history. The dye should be natural, mostly vegetable dyes. You can put a wet cloth on the rug and put there overnight, if the color spills, then the color is not natural. Hence, the rug in question is not a genuine antique or vintage Oushak rug. People then did not have access to artificial coloring. Besides, unlike machine made rugs, the depth of a single color may vary as the wool may have been dyed in different batches. Patterns: Persian rugs mostly depict animals, natural scenery or flower. But, Oushaks were the first to introduce geometric patterns like medallion and stars. A variety of unique and combined patterns are found in both antique and vintage Oushak rugs. Machine made rugs have homogeneous patterns but hand-knotted rugs have human flaws and the patterns are slightly different in different parts of a rug. Tags: In most cases, an Oushak rug should have a tag which identifies the origin and date. If it says “Made in China” or “Made in India”, that is definitely not an authentic Oushak Rug. Also check for the year it was made. Any rug produced after 1968 can not be recognized as either an antique or a vintage rug..However, tags can be missing form a rug for numerous cause. In such situations, ask your dealer or get the help of a professional rug appraiser. Decorating your home with Antique or Vintage Rugs can enhance the beauty of your interior and add a touch of taste and value. They are also considered as investments. 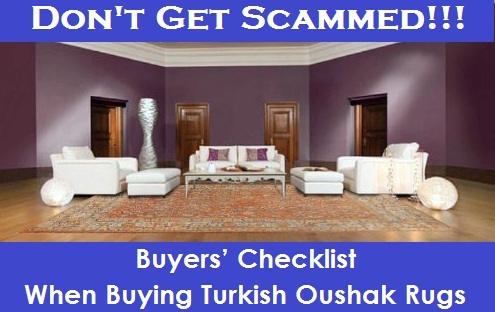 Therefore, when buying an antique or vintage Turkish Oushak rug, you cannot compromise 100% authenticity. The above checklist will help you differentiate among antique, vintage and modern rugs. 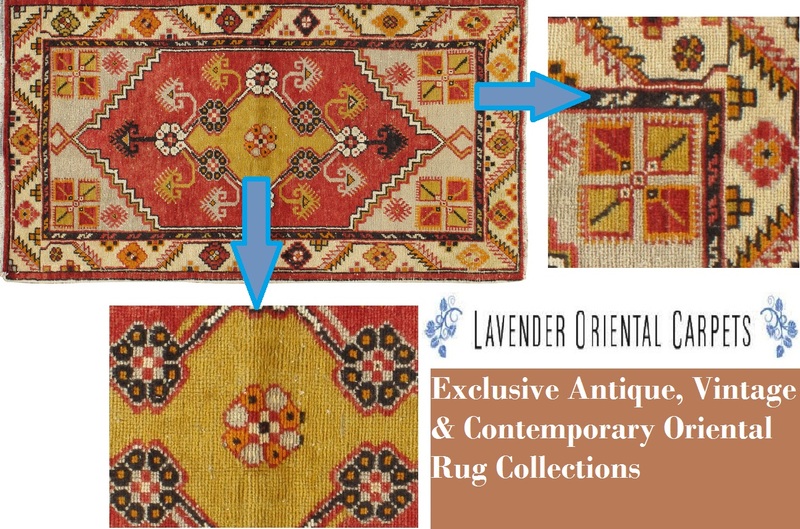 Lavender Oriental Carpets prides itself for 100% client satisfaction in providing authentic Antique & Vintage Rugs. Explore our Antique & Vintage rug collection. Lida Lavender is a specialist on Antique & Vintage area rugs and textiles. She is the owner of Lavender Oriental Carpets, a family business for collection & distribution of Antique & Vintage Rugs. She has years of firsthand experience in dealing antique & vintage rugs & textiles from around the world. Lida is a well-known rug appraiser. She also likes to write blogs about the history, artistic beauty, authentication, style, inspiration and maintenance of antique rugs & textiles.